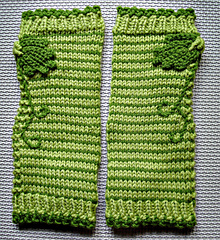 Appliqué mittens are feminine and a delicate. 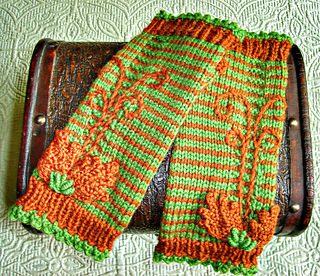 Made in wool and fashioned in a knit and a purl stitch. 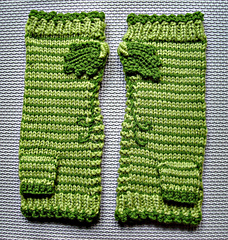 The crocheted leaves, embroidery bullion, and vines make these mittens unique yet stylish. 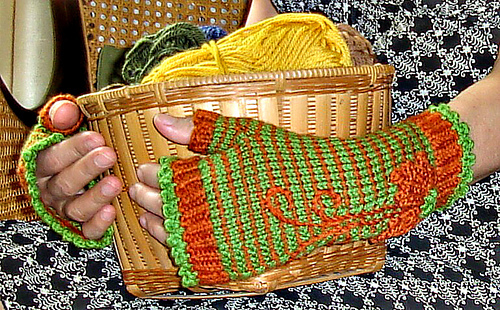 Yarn: Knit Pick Swish DK (100% superwash merino wool) 123 yards/50 gram ball; 1 ball of Green Tea Heather (A), or color of your choice. Denis Nordique (100% wool) 150 yards ball; 1 ball of Bottle Green (B), or color of your choice.